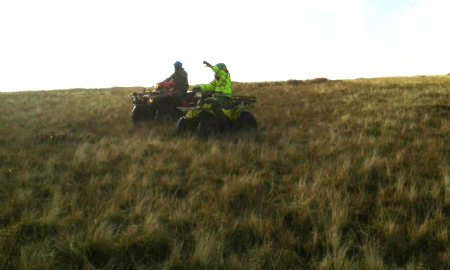 While out walking close to Lugaquilla last Sunday a member of Mountaineering Ireland came across two people on quads. One was described as a young child and the other as an adult. The member said, “They didn’t actually go as far as Lug – I think my taking their photo was enough to deter them. I came across them on Slievemaan. I took their photo and they covered their faces as they went past me, so they clearly knew they should not have been there. 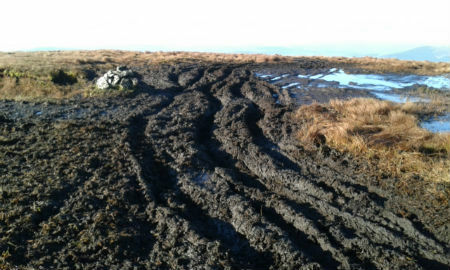 They started to do donuts in the boggy ground between Slievemaan and Lugnaquilla. I followed them down and they drove off towards Ballineddan. As I came down off Ballineddan later I saw two quads on Lybagh. The damage can clearly be seen in the top photograph. New laws prohibiting quads and scrambler bikes is now illegal, a fine of €3,000, have the vehicle confiscated or face six months in jail. The matter has been reported to the Gardai. Mountaineering Ireland have also praised the work of the Gardai for the drop in crime at car parks throughout the county through operation uplands. If you see quad or scrambler bikes on the Wicklow Mountains, phone the National Parks and Wildlife Service Duty Ranger immediately on 087 9803899. While they may not be able to respond, every call received is logged and each one adds to the pressure for this problem to be dealt with.